In this guide you will find more information on how to get audio stream from your RTSP/IP camera device. To implement this example, you need to have OZEKI Camera SDK installed, and a reference to OzekiSDK.dll should be added to your Visual Studio project. 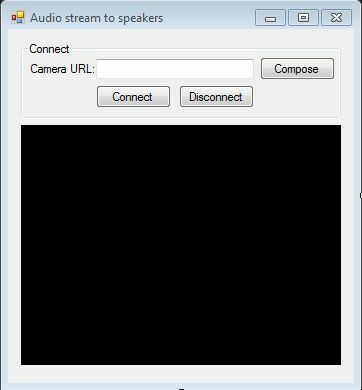 How to get audio stream from an IP camera device using C#? To establish the connection properly between your application and an IP camera you should apply the same code snippet what you have used in the example (How to connect to an IP camera device using C#?). Important: you should study this article in order to find out how to setup your Windows Forms Application correctly. _speaker = Speaker.GetDefaultDevice(): the previously mentioned new object has to be initialized. This is the recommended way for the initializing is getting the default device for playing audio. _connector.Connect(_camera.AudioChannel, _speaker): besides the video stream connection we need another connection for the audio stream in order to be able to play audio. We use the same MediaConnector object for this task that we have used for the video connection. The arguments of the method call are extremely important: the first one is now the audio channel of the camera and the second one is the speaker object. After the successful implementation of the functions and the GUI elements, the application will work properly. Pressing the connect button will load in the image of the IP camera device connected to your PC into the panel that you can see on the picture. Besides this you will hear the audio stream of the camera on your default speaker device. I cannot hear anything. How to solve this? There are cameras which do not support the audio sending or do not have audio recorder. You should verify whether the speaker is not muted. You should verify whether the sound card works properly.